Irresistible curries, stews and other delights await! 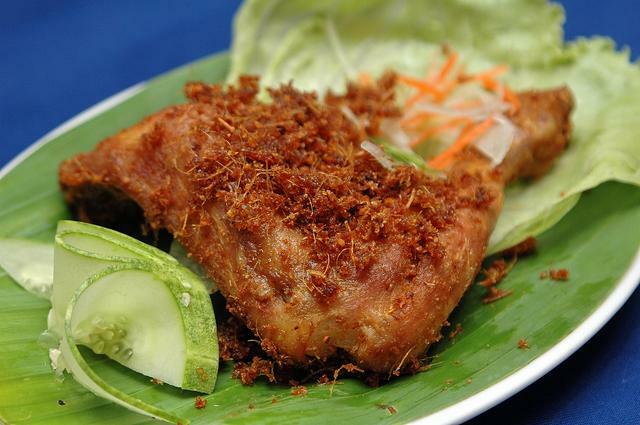 Ayam Goreng Bumbu - love at first bite! Nasi Padang is probably West Sumatra’s most popular export. Originating from a town called Padang, it is a specialty of the Minangkabau community that encompasses a wide variety of dishes, ranging from hot, spicy curries to mild, aromatic stews and deep-fried delicacies eaten with white rice. Now a group of local entrepreneurs aims to conquer Malaysians' tastebuds with their first Nasi Padang restaurant, Sari Indah in Alamanda Shopping Centre, Putrajaya. Executive director, Mohd Najib Abdul Aziz, who first got into the food business with a D’Tandoor franchised outlet, is hoping to evolve further with his latest venture. Together with his three best buddies, they decided that a Nasi Padang restaurant is the most feasible due to its distinctiveness, great appeal and growth potential. 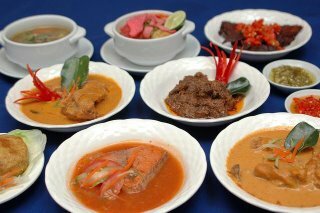 Consequently, the four partners picked Sari Indah, which is famed for its authentic and tasty Minang-Indonesian food. Since opening its doors here in September last year, the first Sari Indah restaurant in Malaysia has enjoyed brisk business. “Besides the civil servant crowd from Putrajaya, we have many Chinese customers who come specially for typical Minang delicacies like Gulai Tunjang (beef tendons in mildly spiced gravy), Ayam Goreng Bumbu (deep-fried chicken with spiced marinade) and Rendang Minang (beef cooked in a dry-style curry),” said Mohd Najib. The kitchen team comprises Indonesian and local chefs whilst many of the herbs and spices are imported from Indonesia. Unlike in Indonesia where the use of monosodium glutamate (MSG) is quite prevalent, the soup stock, stews and sauces here are made using bones, herbs and spices. On the average, diners can expect 20 'must have' dishes such as Ayam Kampung Bakar (roast free-range chicken), Dendeng Daging Balado (dried spiced beef with red chilli), Pergedil (fried potato patties), Gado-gado (Indonesian-style salad with peanut sauce), Ayam Kampung Pop (grilled free-range chicken), Gulai Tunjang, Asam Padeh Tenggiri (spicy and sour fish curry), Telur Dadar (spiced omelette) and Ayam Kampung Gulai (spicy curry chicken) amongst others on the main menu. In addition, ten other specialties are served on rotational basis daily, giving regulars a chance to sample something different on each visit. These include Soto Padang (spiced Padang soup), Sambal Cumi (squid in spicy sauce), Gulai Babat (stewed cow’s stomach), Ikan Pepes (steamed spicy minced fish in banana leaves), Sayur Singkong Lemak (cassava leaves in mildly spiced coconut gravy), Paru Goreng (deep-fried cow’s lungs), Pucuk Paku Tumis (stir-fried fern shoots), Gulai Nangka (young jackfruit in coconut gravy) and Ikan Talapia Bakar (grilled fish). However, uncommon delicacy like the Gulai Otak (braised cow’s brains in spiced stew) is harder to come by so if you wish to savour this, be sure to notify the outlet in advance. 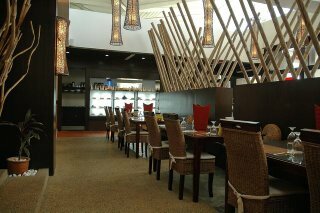 The outlet boasts of a modern interior with lots of cosy touches in the form of dark wood, bamboo and stone accents. To complete the dining experience, Sari Indah adheres to the true service-style of a typical Nasi Padang restaurant – staff will bring an array of small, varied dishes to the customer’s table, balancing the plates along the length of their arms. While it may take some getting used to, diners just have to select their preferred dishes and the rest will be returned to the kitchen. Another point to remember is the various dishes are served cool as Indonesians usually eat their food this way unlike the Chinese who expect their dishes to be piping hot. Happily, the plethora of dishes passed the taste test as our Indonesian friend thoroughly enjoyed the feast of home-style delights. The Gulai Tunjang was memorable for the beef tendon’s succulent texture complemented by a piquant spiced gravy. I found the Gulai Babat (Perut) a tad strong for my liking so this is an acquired taste. Crispy yet flavourful, the Dendeng Daging Balado left an indelible impression with its robust red chilli topping. Other noteworthy dishes include Ayam Kampung Gulai, Ayam Goreng Bumbu, Sambal Ijo (green chilli sambal) and Ikan Talapia Bakar (grilled fish in spiced marinade). Side orders and starters are priced between RM2.00 and RM5.00 each plate, main meat and fish dishes between RM5.00 and RM23.00, and vegetable dishes from RM4.00 onwards. Dessert is not prominently featured but the outlet’s chilled concoctions such as Es Teler, Es Sari Manda, Es Cendol, Jus Alpukat, Jus Terung Belanda, Jus Sirsak and Jus Tomel are adequate enough to keep sweet-toothed customers happy.